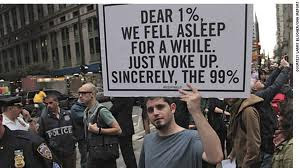 Hattip to Ed Cone for pointing us to this Eliot Spitzer essay, "Occupy Wall Street Has Already Won"
"Suddenly, the issues of equity, fairness, justice, income distribution, and accountability for the economic cataclysm – issues all but ignored for a generation — are front and center. We have moved beyond the one-dimensional conversation about how much and where to cut the deficit. Questions more central to the social fabric of our nation have returned to the heart of the political debate. By forcing this new discussion, OWS has made most of the other participants in our politics — who either didn’t want to have this conversation or weren’t able to make it happen — look pretty small." The smallest of those minds have fallen back on two ancient memes for expressing disdain for the Occupy Movement: (1) the protestors are "dirty," in as many senses as you can imagine; and (2) they're "Marxists" (which, come to think of it, is intended as a form of dirtiness). To alienate oneself from a perceived enemy on the basis of cleanliness is at heart a racist instinct. And to label those seeking economic equity as "Marxist" is a throwback to the "red-baiting" of the 1950s and guilt by association. I very much doubt that you could find one in a thousand of the protestors all across this country who've ever read a single paragraph of Karl Marx (1818-1883), but who can tell a hawk from a handsaw ... in these days of concentrated wealth and concentrated political power that comes from being able to buy politicians. Attempting to make the political enlightenment of 2011 untouchable and unholy by labeling it with primitive and crude terms from past centuries will not turn this tide. Labels: revolution in the U.S. They don't have to read Marx's original writings. They've been brainwashed by a barrage of socialist teaching in the classroom and leftist mainstream media for a couple of generations now. 99% my foot! Oh and by the way, they wouldn't know the Constitution if it bit them either. "They've been brainwashed by a barrage of socialist teaching in the classroom and leftist mainstream media for a couple of generations now." are brainwashing children with socialist ideas? Have you been in a classroom, anywhere, in the last 20 years? Because frankly that's bull**it. No, Not Really, it is NOT BS. What Tea Party Guy says is true. The problem is that most of the so-called Right have fallen for the socialist, centralized control scheme also. 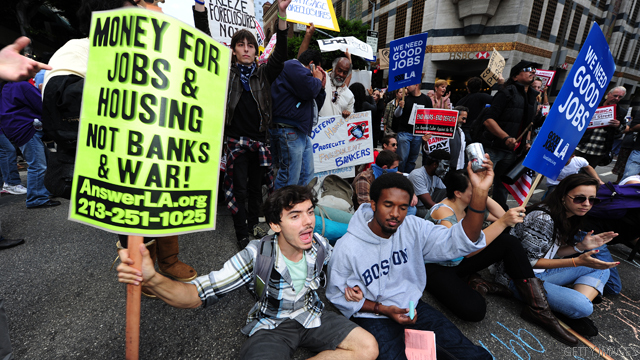 And the Occupy Wall Street movement should target the real villains---the Federal Reserve. These domestic and international banksters control Wall Street and the federal government. Believe it or not. Think about it. David Domke writes for Daily KOS, Huffington Post, and Counterpunch. I'm not sure why one would quote him concerning conservative vs. liberal bias, as he seems to have a horse in the race. As for bias in the classroom, I have seen it over and over and heard about it even more. I'm not going to name individuals from the schools I have attended, but what I will point to is the organizing of students, by professors, into forces which then engage in public political protests. Although I may have never set foot in the classrooms of individual professors who have engaged in such behavior, I cannot imagine a reasonable argument that such professors keep their politics out of the classroom. Do their student armies show up for protests not knowing why they are there? Thus speaks the voice of experience, doesn't it JW? Lefties like you and some of your commenters have been trying to demonize the Tea Party with "primitive and crude" terms for two and a half years now, and failed miserably. Although...I do owe a debt to whichever of your lefty commenters first tried to insult me with "Teahadist." I've both taken and taught a lot of college courses, and, for the most part, I'd agree that what Tea Party Guy says about the classroom is BS. But the larger point is, what difference does it make? Are Tea Party Guy and other suggesting that university professors hold that much power over their students? Can they really brainwash students into believing their left-wing ideologies? As a professor, I'd give anything to have that much influence on my students...not to change their politics, but to get them to learn the material I'm trying to teach them! I don't understand how discussing the involvement of Marxist groups in the Occupy Wall Street protests makes any comparison to the cleanliness of the protesters, and I have no idea how you could then stretch that into some form of racism. I mean, your premise is correct, the small percentage of Marxists in America is fully engaged with the Occupy Wall Street protests (globally, in fact). But your first conclusion, that noticing the ideological involvement of Marxists is a way of criticizing their hygiene makes no sense whatsoever. And to use that first false conclusion as a basis for reaching the farther fetched conclusion that this is racism is beyond preposterous. I am not sure where the disconnect from reality lies, but this link is a straightforward declaration of solidarity and participation from the Communist Party USA. This is not FoxNews or Glenn Beck speculating. This is straight from the mouth of the Communist Party. I don't know how much clearer it can get. So, I guess noticing the solid presence of the Party for Socialism & Liberation, the Workers World Party, and the ANSWER Coalition makes me a small-minded racist? Mike, you never answered my question about how you interpret "the general welfare" clauses in the constitution. The preamble covers defense, justice, domestic tranquility, union, and liberty in separate clauses. If healthcare, education, and employment are not under general welfare, what is? I am not qualified to answer your question, as I do not have a copy of A New English Dictionary on Historical Principles; Founded Mainly on the Materials Collected by The Philological Society, from 1884 (precursor to the Oxford English Dictionary). Therefore, I cannot properly provide a contextual definition of "welfare". Most people believe that Amendments and Supreme Court rulings are the only ways to change the Constitution, but I would argue that changing society's understanding of the meaning of words like "justice" and "welfare" is much more common and effective, though dishonest and reprehensible. Mike - That was a BS answer. Why don't you look up the definition of welfare, and while you're at it, look up the definition of sophistry. Sophistry - tricky, superficially plausible, but generally fallacious method of reasoning. You ask me to look up the definition of "welfare", but if I do, I will surely find the definition from the 2010 or 2011 edition of whichever dictionary I choose, and that is exactly my point. There is nothing tricky about suggesting that a word may have held a different meaning 230 years ago, and since you are taking the liberty of interpreting a 230 year old document with modern definitions, I would like to suggest that if one of us is employing tricky, fallacious logic, it is not I.
I will be the first to backtrack and submit to a wiser mind if that definition is the same, 200 years ago, but I do not have the proper antique reference book to check. When you have finished name-calling, perhaps you will check your bookshelves for an 18th Century dictionary? Todd P. You seem to be arguing that professors don't have very much influence over their students. If you find that to be true as it pertains to you, perhaps you should find another line of work? Now, explain why health, education and employment do not fall under the general welfare clauses of the constitution. And why wouldn't you call the founding fathers Marxist based on their inclusion of this clause? Mike D raises an interesting point, one I just addressed in my graduate social justice class the other night. We looked at the US Constitution, Declaration of Independence, and Pledge of Allegiance to try to decipher what it is we value as a people. The consensus was that it is not possible to know what was in the minds of the founders when they used such words if we merely refer to contemporary dictionaries. It is, however, possible to know what they were thinking by reading their writings. The problem with that approach is that this assumes that people alive today share the same values as the founders (who owned and slept with slaves, permitted only rich whites to vote, etc.). We as a people and a nation have changed since then. My argument to the class was that we value liberty and equality not so much because the founders said we should (they did, even though they did not actually practice it), but because of the hard work and sacrifice of thousands of people over the years to assure that we gained these rights. So words like "establish Justice," "promote the general Welfare," "secure the Blessings of Liberty to ourselves and our Posterity," rights including "Life, Liberty and the pursuit of Happiness," and "with liberty and justice for all" have to be interpreted based on today's understanding of the words. They mean to us what they mean not because of what the founders meant but because of what they mean to us now after hundreds of years of struggle. The undeniable fact is that we are progressing as a nation and as a people. That is, we are becoming more progressive (or "liberal" if you prefer). Look at rights for minorities, women, gays, etc. for evidence. Heck, look at who is the President and the (as of now) leader in the challenging party (both are Black!). We still have a long way to go, but we are getting there. What does this have to do with the "Occupy movement?" IMHO, these people on the streets are normal Americans who share the progressive spirit I am talking about, who, for whatever reason, have been awoken by realities of an unfair political and economic system that has for so long kept them relatively poor while simultaneously enriching a tiny fraction of the population. To call them Marxists or communists of socialists or to point out the various such groups that have signed on to this movement misses the point that these are real people with real gripes and we will all benefit enormously if they develop specific, tangible demands and if those demands are ever met. Mike, If you are going to discount the welfare and justice clauses because the meanings may have changed (even though you provide no plausible evidence to support that assertion) you will surely agree that the second amendment MUST be discounted. We can all agree that the founders had no concept of modern automatic weapons and therefor the right to bear arms can't apply to any weapons more advanced that what existed in 1780 , or thereabouts. My argument to the class was that we value liberty and equality not so much because the founders said we should (they did, even though they did not actually practice it), but because of the hard work and sacrifice of thousands of people over the years to assure that we gained these rights. Hm. Makes me wonder why the founders said those ideas were good? Why did people sacrifice for them? Maybe because there's something important about them that goes beyond whatever opinion happens to be popular right now? Possibly. That, in turn, makes me wonder why you pushed your students into the false dichotomy of worshiping a bunch of dead people or supporting the protesters (which, in its own turn, takes us back to the beginnings of this thread, doesn't it?). I did not push my students to anything. So I can see you still have a problem with reading comprehension. If Only It Were True! Panic of the Plutocrats, Indeed! She Loves Jesus and Has a Gun Named "Bessie Mae"
Sen. Forrester: "Nothing To See Here. Move Along"